Even in the best of times, people with significant assets may find themselves on the wrong end of a lawsuit. Most physicians, for example, will be sued for malpractice at least once during their careers, and they pay high premiums for liability insurance, which may not cover the entire exposure. Other professionals and business owners also are frequently dragged into court, and adverse judgments may put family assets at risk. But if the wealthy are targets of lawsuits even when the economy is strong, they’re all the more vulnerable these days, when financial desperation may motivate people to take a legal shot at anyone for any reason. And if a judge or jury sides with the plaintiff, a defendant could lose business interests, investments, or other property. In some states, the simple act of purchasing life insurance and annuities can help to protect assets. But whatever strategy you follow, you need to act before there’s a problem. If you’re already being pursued by creditors or embroiled in a lawsuit, the courts may disregard moves to shield your property. Consider these possible asset-protection strategies and vehicles. Transferring property. One simple way to protect assets is to give them away. You can transfer as much property as you like to your spouse (if a U.S. citizen) free of estate or gift tax, and under the annual gift tax exclusion, you can also make gifts of up to $14,000 a year to anyone else. Moreover, you’re entitled to a lifetime, cumulative gift tax exemption ($5.45 million for 2016). But making property gifts means relinquishing control, and spousal transfers may create estate tax complications. Forming a corporation. If your fortune is tied to business interests, a traditional method for avoiding personal liability is to establish a C corporation. In the absence of fraud, you normally won’t be liable for corporate debts, but you also aren’t necessarily protected against professional liability if you are a professional. The personal liability protection of a C corporation is not impregnable, however, as the courts have increasingly allowed persistent plaintiffs to “pierce the corporate veil” and reach a defendant’s personal assets. Other corporate variations, such as S corporations and limited liability companies (LLCs), offer protections similar to those of a C corporation, and those alternative business structures may give you tax advantages. Generally, a C corporation is taxed twice—the business pays income tax, and then you’re taxed on the dividend you receive—whereas S corporation shareholders and LLC members get only a single tax bill. The LLC format, compared with the older S corporation, has fewer restrictions, but may have higher taxes in some states. Owning assets jointly. Another long-standing asset protection strategy is to title property as joint tenants with your spouse or another family member. If assets are owned by “joint tenants with rights of survivorship” (JTWROS), they automatically pass to the survivor upon the other owner’s death. A special type of co-ownership only between a husband and wife, known as “tenancy by the entirety” (TBE), may protect assets from creditors. More than half the states now recognize TBE protections. In the nine community property states, on the other hand, property acquired during a marriage is generally treated as being owned by both spouses, regardless of how it is titled, and could be accessible to creditors of either spouse. Domestic trusts. 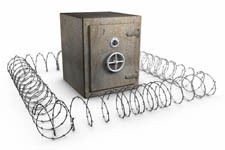 Various kinds of trusts created within the United States can help shield assets from creditors. For example, you could establish a “spendthrift trust” for a child. Normally, that involves transferring control of trust assets to a designated trustee, who will manage the trust. Creditors can’t touch the assets before the beneficiary actually receives a distribution. The maximum protection is obtained with a discretionary trust which does not require distributions to be made at any particular time. Self-settled trusts. A self-settled trust is one you form for your own benefit—you’re the beneficiary as well as the grantor. Currently, 11 states allow you to establish self-settled trusts to protect assets from future creditors. To qualify, the trust must generally adhere to the laws of the state, have a trustee resident in such state, and be irrevocable. Foreign trusts. A foreign or “offshore” trust can be a legitimate means for protecting assets by subjecting the property to the more lenient laws of a foreign jurisdiction. But foreign trusts also have disadvantages, including tax reporting requirements, lack of tax benefits, and concerns about trustees. Devising an effective asset-protection plan is often complex and subject to crucial missteps. We can work with you and your attorney to create a plan that provides effective legal protections. What Should You Spend First During Retirement? Copyright 2016 JFR Financial Services, Inc. All Rights Reserved. Copyright 2019 JFR Financial Services, Inc. All Rights Reserved.